One of the questions that I think I get most often is, “How do we know what’s right by God?” With many of the hot-button issues in our society and in our churches taking center stage, and with the conflicting interpretations and understandings of scripture, how do we figure out what is right? It’s not easy. Please don’t expect it to be. Just as Jacob spent the night wrestling with God and walked away with a limp that would last a life time, we will find ourselves stretched and tested in ways we never expected. As United Methodists, we have a method to help us navigate our way through these difficult moments of confusion in order to find spiritual direction and a deeper understanding. We call it the “Wesley Quadrilateral”. Imagine your faith resting firmly upon a table. Four legs hold that table up. Should you remove one, the table would be unsteady. Should you shorten one leg and leave the others, the table would wobble and you wouldn’t want to sit you most prized china on top of such an unreliable surface. 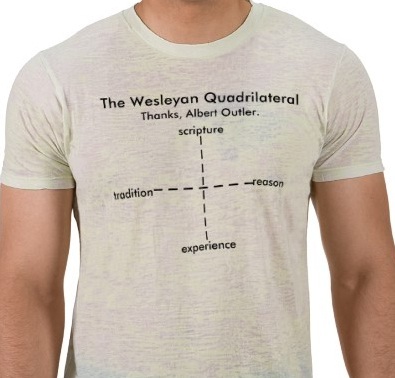 The Wesley Quadrilateral is like this. Scripture–Scripture is imperative. This is how God has revealed Godself to us. It not only enlightens us, it guides us, and it brings us closer to Christ (God incarnate). So this is where we must begin. But be careful not to fall into the temptation to “prooftext”–the act of finding references that make your point rather than letting scripture inform you. What is the context of the scripture? What happens just before it and just after it? Are their conflicting scriptures? Tradition–As for me, I am a part of the United Methodist Church, so this is the tradition I will look at most closely, but I cannot ignore the traditions of the universal Christian church. For two thousand years men and women have been wrestling with God’s word in the world in which they live. Traditions are born of that struggle and we should give them a proper audience. This is not to say that traditions are written in stone. They can, and do change. But they can teach us so much about how God is working in the world of today and yesterday. Reason–God made us thinking creatures for a reason, so don’t be afraid to use your brain. Sometimes the greatest weapon we have against false teachings is our mind. Think about the issue you are struggling with, analyze it, weigh it out. Seek out the wisdom of others to help inform your. Commentaries on scripture can help. Thoughtful opinions by others (both by people with which you agree and with people with which you disagree) can stretch your understanding. Don’t be afraid of arguments that are opposite your opinions. Engaging in thoughtful discussion with people of another frame of mind can not only help you to understand their position better, but can help you to understand your own better as well. Experience–God is a living God. God is still active in this world and still speaking with us. God’s influence is evident all around us. So don’t be afraid of taking a look at your own experiences and seek evidence of the Holy Spirit in them. And listen to the experiences of others. They have had encounters with God that you haven’t. This is why it’s so important that Christians are willing to share their experiences amongst each other, so that we can learn of the different ways God is interacting with God’s children. These four aspects cannot be taken by themselves. They are all a part of that foundation upon which our faith rests, so think about each aspect, but look at them together in order to figure our what Christ is trying to reveal to you. Reblogged this on The United Methodists of Rivesville. Our struggle is much the same a Jesus’. Men tried to make him doubt his own beliefs. So it is with us. A perfect jab at one of us might be ,” Why do you believe as you do?” And the follow -up,”If you believe such and so why do you not practice what you preach?” The answer to that is simple;we are human and the flesh does not often do what is best for the spirit.Four legs that will keep us on a stable foundation.Thanks Pastor Amanda.